Ordos’ Kangbashi ghost town gets a lot of press. The old downtown of Dongsheng, relatively little. That’s a bit of a pity, though, since in my half-day there I found it a very interesting place, almost unique among those I’ve visited in China. Urban incomes in Ordos are almost as high as those in Beijing. This is almost unheard of in China, where smaller inland cities (and especially those in the desolate northern wastes) tend to be much poorer than on the prosperous coast. A booming coal industry has been good to Ordos. While some of that windfall was plowed into building Kangbashi, a lot of it sustains the affluent lifestyles of the much larger population of Dongsheng. One wonders that if the ghost town had never been built, attention instead would turn to Dongsheng, an oasis of wealth in the unlikeliest of places. Hours after arriving in Dongsheng, something about it seemed ‘off’, though I couldn’t put my finger on what. Later I realized that it kept reminding me American cities, specifically mid-sized cities in the heartland like the ones I drove through on cross-country trips (not to mention grew up in). Why Dongsheng feels American 1: A rigid grid of wide roads. This is hardly unique to Dongsheng, but it means that Dongsheng doesn’t feel like it was built on top of an ancient town, as is true in several big Chinese downtowns. Why Dongsheng feels American 2: Very wide building setbacks, with lots of surface parking. You almost never see designated parking areas for cars in front of businesses in Chinese downtowns (one of the reasons rude drivers park on sidewalks instead), so it jumps out at you when they are present. With huge spaces between roads and buildings, Dongsheng’s main avenues had space for plenty of them. Why Dongsheng feels American 3: Low building heights. This one is relative, of course, but building after building in downtown Dongsheng felt shorter than years of visiting Chinese cities has led me to expect. Together with the wide setbacks, this gave me the impression that space was not at a premium in Dongsheng, and planners had more room to sprawl than in most Chinese cities. Ordos’ location bears out this hypothesis, sitting in the middle of an arid plain with a limited peasantry and few nearby towns. (Of course there must be more to the story than this, because if planning rules really did allow Dongsheng to expand to its heart’s content, there would have been no impetus to build Kangbashi 20 miles away). Why Dongsheng feels American 4: No pedestrians. 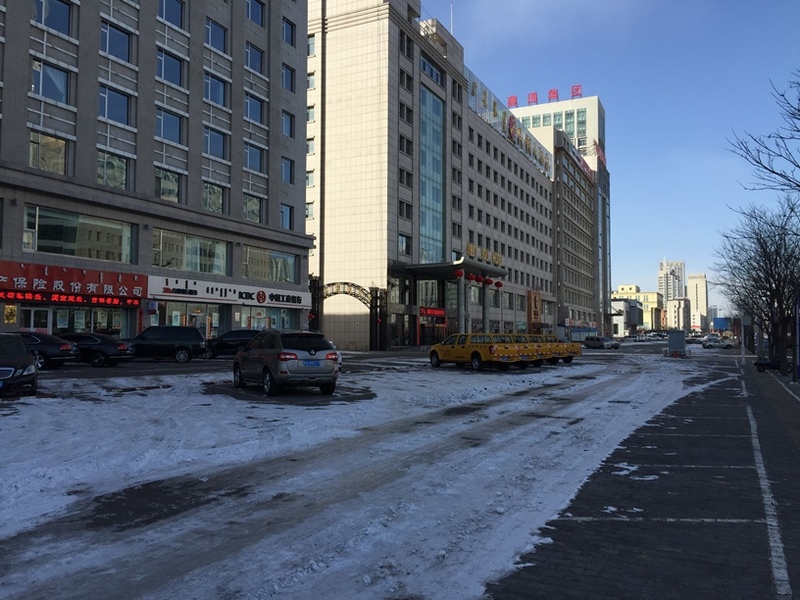 With almost zero fellow pedestrians on the sidewalks and many (often nice) cars on the road, Dongsheng feels as auto-oriented as any American city worth its salt. Typical Chinese cities throb with pedestrian activity and street life, including numerous jaywalkers that make life havoc for drivers. Not so in Dongsheng. The weather was surely a factor here, as plummeting temperatures and bone-chilling winds were driving people indoors just as I arrived. 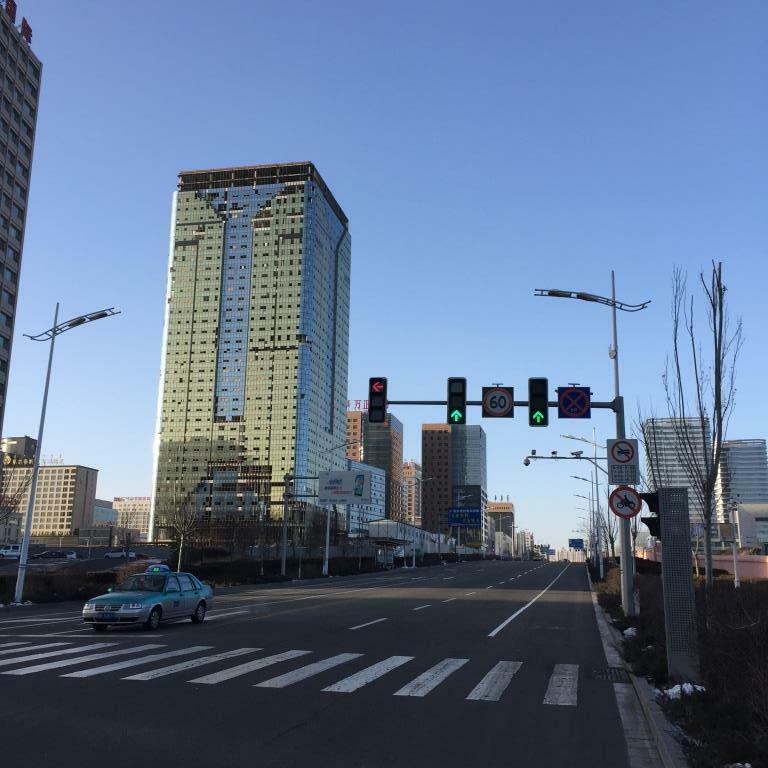 But I bet even in spring and summer the streets of Ordos are relatively empty. Why Dongsheng feels American 5: No pollution. The piercing blue Mongolian skies of Dongsheng will make any newcomer forget they are in China.